This camp is full! If you would like to place your child on the waiting list, please contact Liz Schultz at tourinfo@oberlinheritage.org or 440-774-1700. August 16-20 (Monday through Friday, 9:30 a.m. - 4 p.m.) Architecture Camp for boys and girls ages 8-13. 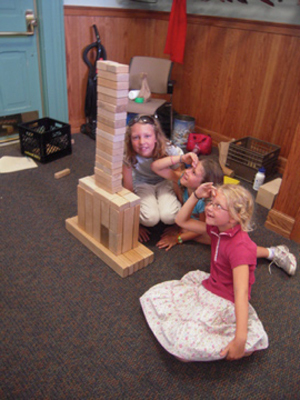 Campers will learn about architecture and the design profession by exploring local buildings and their unique details, trying architectural drawing and building activities, constructing mini-buildings, and meeting with an architect. Boy Scouts and Girls Scouts attending this camp will complete some requirements for Architecture badges and Interest Projects. Held at the Oberlin Depot with some walking field trips to interesting places nearby. Fee is $95 ($85 for children and grandchildren of members); partial scholarships may be available to those who qualify for schools' free lunch programs. Register online at www.oberlinheritage.org or call Elizabeth Schultz, Museum Education and Tour Coordinator, at (440) 774-1700 or e-mail tourinfo@oberlinheritage.org.